On occasion of the International Day Against Homophobia, Transphobia & Biphobia (IDAHOT) held on the 17 of May every year, Transgender Europe (TGEU) is publishing the Trans Murder Monitoring (TMM) project update to join the voices raising awareness on this day about the multiple forms of discrimination and violence faced by LGBTI people worldwide. This update (TMM IDAHOT 2016) reveals 100 reported murders of trans and gender diverse people in 2016, which is the highest number in the first 4 months of the year registered by the TMM project since 2008. 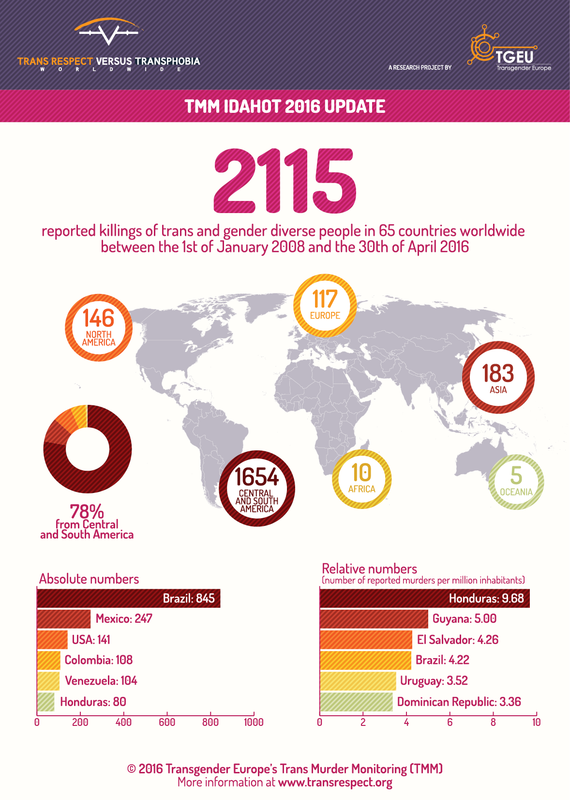 In total, the numbers add up to 2115 reported killings of trans and gender diverse people in 65 countries worldwide between the 1st of January 2008 and the 30th of April 2016, 1654 of which were reported in Central and South America. Throughout all six world regions, the highest absolute numbers have been found in countries with strong trans movements and civil society organisations that carry out forms of professional monitoring: Brazil (845), Mexico (247), Colombia (108), Venezuela (104), and Honduras (80) in Central and South America; the United States (141) in North America; Turkey (43) and Italy (34) in Europe; and India (55), the Philippines (40) and Pakistan (35) in Asia. The situation in Brazil is especially worrying, with 40% of the cases since January 2008, and 42% of the cases in 2016 so far worldwide. “One of the factors contributing to the increase in the already high number of trans and gender diverse people murdered in the country is the recently-established cooperation between TGEU and the Brazilian trans network Rede Trans Brasil. This allows for a joint effort in more thoroughly and professionally monitoring and reporting the violence against trans and gender diverse people,” explains TGEU’s Transrespect Officer, Lukas Berredo, who joined TGEU’s Transrespect versus Transphobia Worldwide project team in 2016. The theme for IDAHOT 2016 is “Mental Health and Well Being”. In most countries, trans and gender diverse people must receive an official mental health diagnosis in order to access gender affirming services and legal gender recognition. This psychiatrisation of trans identities strongly contributes to the stigmatization and violence towards trans and gender diverse people. For More Information: TGEU Senior Researcher, Carsten Balzer/Carla LaGata, and TGEU Transrespect Officer, Lukas Berredo, are available for interviews and questions, and can be reached at carla[at]tgeu.org or at lukas[at]tgeu.org, respectively. The International Day against Homophobia and Transphobia (IDAHOT) is dedicated to raise awareness about the alarming situation of discrimination and violence faced by lesbian, gay, bisexuals, trans, and intersex people. It was specifically chosen to commemorate the World Health Organization’s decision in 1990 to declassify homosexuality as a mental disorder. The TMM IDAHOT 2016 update reports killings of trans and gender diverse people between January 2008 and April 2016 in all world regions: 1654 killings in 23 countries in Central and South America, which account for 78,2% of the globally reported murders; 183 killings in 16 Asian countries; 146 killings in North America; 117 killings in 16 European countries; 10 killings have been reported in 4 African countries; and 5 killings in 4 countries in Oceania.